On average 75% of the customers who come into our Service Department are driving on bad tires that need to be replaced. We understand that tires are a big-ticket item and we try to prepare our customers for the timing of that expense with our multi-point inspection. There is an additional labor cost mounting and balancing and a recommended alignment. The life expectancy of a quality tire can be 60-80K miles, while an inferior brand may only last 30-40K miles. This a generality. High-performance tires will likely only last 25-30k miles. You should start shopping if your treads reach 4/32nds tread depth. If your tread depth reaches 3/32nd, your tires definitely need to be replaced. It is highly recommended that you replace all four tires at the same time for both even wear and safe driving. Kia Country recommends Michelin, Kuhmo, and Nexen, but carries other reputable brands as well. We and tires that are designed specifically for fit and performance with your Kia. You can search Tire Source by your car’s model and year to find out which will work best with your car. Your Owner’s Manual will also tell you what size and type tires are recommended for your car. Kia Country offers Buy 3 Tires, Get One for a $1 which makes our prices very competitive. However, if you find a lower price for an identical set at a local retailer, we will price match. Yet, despite the expense tires are critically important to your safety and the way your car drives. 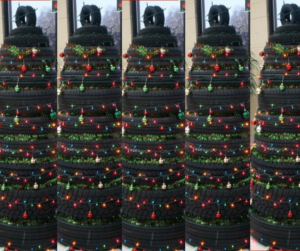 We encourage customers to consider tires as a holiday gift for either themselves or a loved one. In addition to our tire sale, we are offering a four-wheel alignment for only $49.95 (reg. $79.95). Tire Tip: As the weather gets colder, remember that tire pressure is affected by temperature. We suggest putting an extra 2lbs of pressure in your tires. Our Service Managers are available to answer any questions you may have, help you to choose the best tire for your vehicle or to special order tires.